Plastic coated raised draining platform allows water to drain away from plates bowls cups and cutlery. Suitable for use on all sink draining boards. Plastic coated steel prevents plates from chipping and scratching stainless steel draining boards. 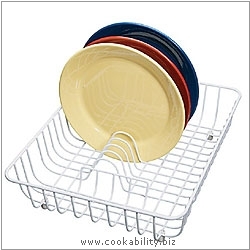 Plates shown are not included but should hold 11 of similar size.